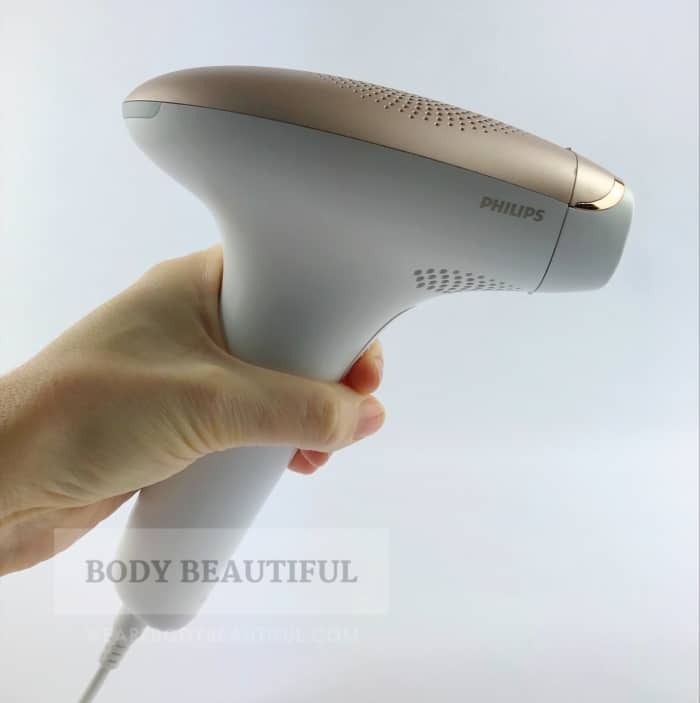 Philips Lumea Prestige vs Lumea Advanced - Which should you choose? 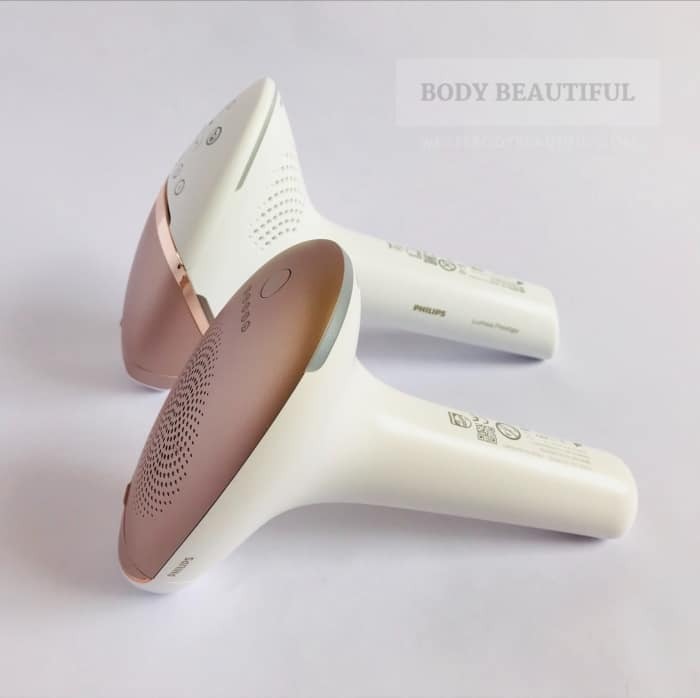 Which is best, Lumea Prestige BRI956/3/0 or Lumea Advanced SC1999/97 ? Both are great choices from Philips. Both will last for ages, have exceptional build quality, look beautiful and give great results. 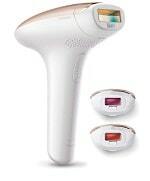 However, the Lumea Prestige is the flagship, premium model with a better specification, and a higher price tag. It’s packed with unique features unmatched by any other brand. 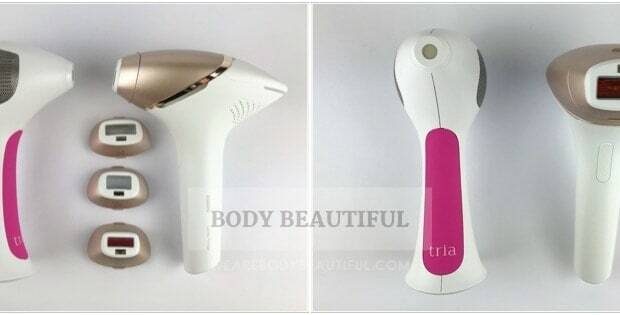 The Lumea Prestige and Lumea Advanced look very similar. In these photos the Prestige is at the back. The Lumea Advanced is a mid-range, above average choice. The Prestige is Philips flagship model and has a premium, higher spec and is usually more expensive. Both have exceptional build quality and are fine choices but for different uses. Check the scoring criteria comparison and spec table below. There’s a lot to love about both of these devices. Keep reading this comparison roundup for both devices to help you decide. 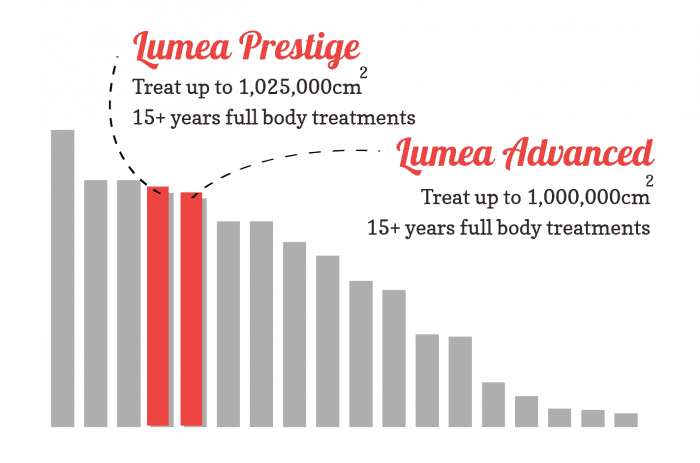 This chart shows how long the Lumea Prestige IPL and Lumea Advanced last compared to each other and other devices. There’s a small difference in the total body area you can treat with each. Both will give 15+ years of monthly full body sessions from the flash bulb. Both give a minimum of 250,000 flashes and the Prestige has a marginally bigger flash window so it can treat a bit more than the Advanced. But there’s not much in it. 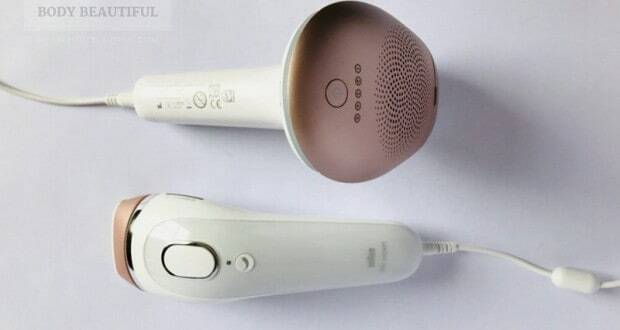 They both have a long lamp lifetime lasting 15+ years of monthly full body treatments (Philips say up to 20). They’re both excellent value, some of the best, and provide many more flashes than you’ll likely need. Both models have exceptional build quality and feel great to hold. They have a great gun-shape that’s intuitive, easy to manoeuvre and precise to position. The Prestige is slightly larger and heavier than the Advanced because there’s a rechargeable battery inside. The Prestige weighs 560g and the Advanced 370g. They’re are many similarities between the two. But the Prestige scores higher than the Advanced for ease of use because it has several additional, impressive features. To start, the Lumea Prestige is safe for all but the darkest skin tones (I to V). The Advanced is safe for lighter complexions, up to medium skin tones (I to IV). Both have 5 intensity levels but the Prestige has more powerful IPL. So, if you have light skin and can use the highest intensity level you’ll get your fastest possible results. Secondly, both have a skin tone sensor and won’t flash if your skin is too dark. But the the Prestige’s is more advanced. It checks then recommends the best intensity level for your skin. You can then manually lower it a notch or two if necessary to find the perfect level. Next, the Lumea Prestige and Advanced both work on mains-power so they’re ready to go when you are. Their cords are very long at around 2 metres meaning there’s plenty of room to manoeuvre. But the Prestige also works cordless. That’s very helpful for harder to reach areas where a cord gets in the way. Or for using on your face in the privacy of your bathroom. So, you can choose which is most convenient whenever you want. Then there’s the specialist treatment windows. They’re designed to match specific body areas and better target stubborn hair in the bikini area. The Advanced SC1997 comes with 2 (body and precision) and the SC1999 with 3 flat treatment windows (body, precision and bikini). But the Prestige does it again! The attachments are curved to match the contours of each body area. All models come with a large curved-in body attachment. I especially love this. It’s much easier to get continuous flashes and accurate coverage on your legs. The other attachments are curved to match your upper leg and bikini line curve and underarms. The facial attachment is small and flat which is best for the contours of your face. No other device has these curves and I think they’re ace. It’s so much easier to position and cover your skin precisely. Top marks. The biggest difference between the Prestige and the Advanced is the speed of treatments. You can finish a full leg from around 14+ mins with the Lumea Advanced. This is good, but the Prestige has it beaten. It has a much quicker flash repetition rate. Philips say you can finish a full leg in around 6:30 mins. In my experience it’s more like 10 mins because I’m very thorough. It’s the quickest high power IPL out there. It’s a fantastic choice for treating large areas or your full body in one sitting. 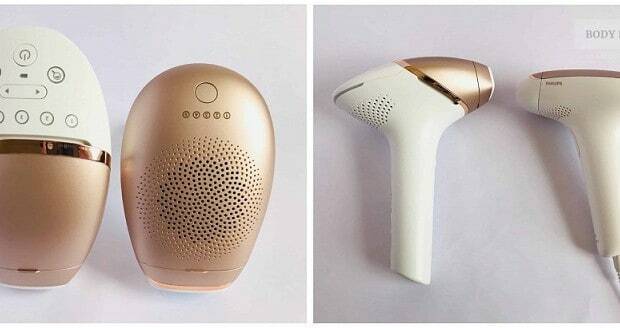 The slower speed may sway you from the Lumea Advanced. But if it matches your budget range, don’t be disheartened. The online reviews for the Advanced share they split their treatments across days when treating larger areas like legs. This means it’s not too tedious. And for smaller body areas the Advanced is fine – it takes just minutes. So it’s a fine choice for face, bikini line, underarms and forearms. Philips have an excellent reputation and they give expertly and prompt advice to questions. Their customer support is excellent. You can get advice and assistance via online chat, phone and email. They give a 2-year warranty and an online support service. You also get a helpful treatment calendar App with ‘how to’ guides. Plus a reassuring and easy to use 100-day money back guarantee from Philips for both models. Both devices have excellent online feedback and helpful reviews with the same average score. The online feedback for the Lumea Prestige is overwhelmingly positive. The reviewers love the fast no-fuss treatments and report great results. 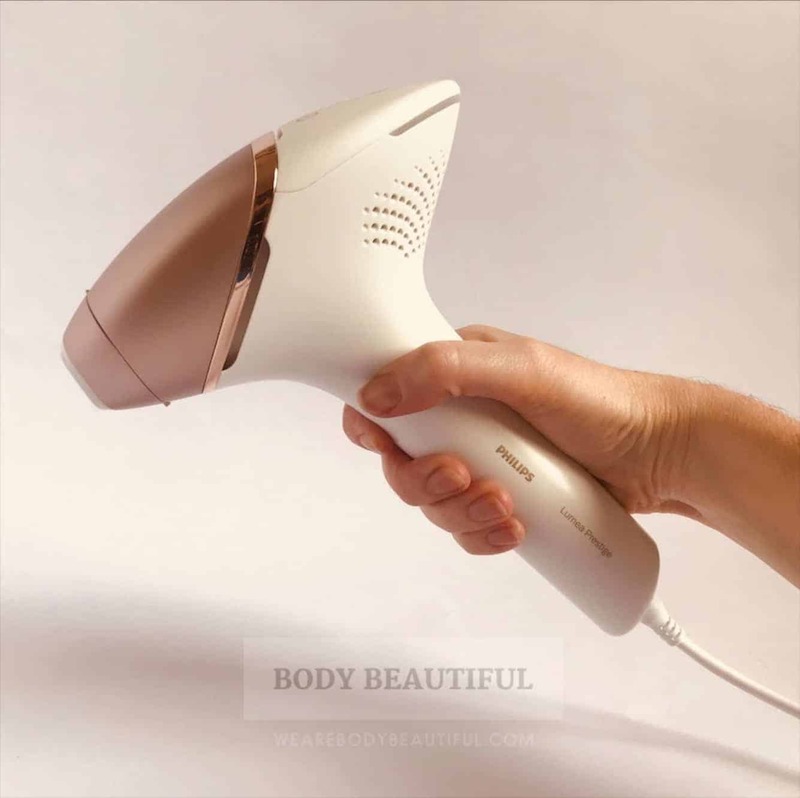 For the Lumea Advanced there’s loads of love for the lightweight, gun-shape and mains-power operation. Very few negative comments. Read the full reviews for the in-depth online feedback round-up. Often the deciding factor is cost. The Prestige’s Recommended Retail Price (RRP) is £520 to £575. That’s versus RRP £350 to £385 for the Advanced. With offers you can get the Prestige for around £270 to £400, and the Advanced for about £220 to £270. You can check the prices using the links below. 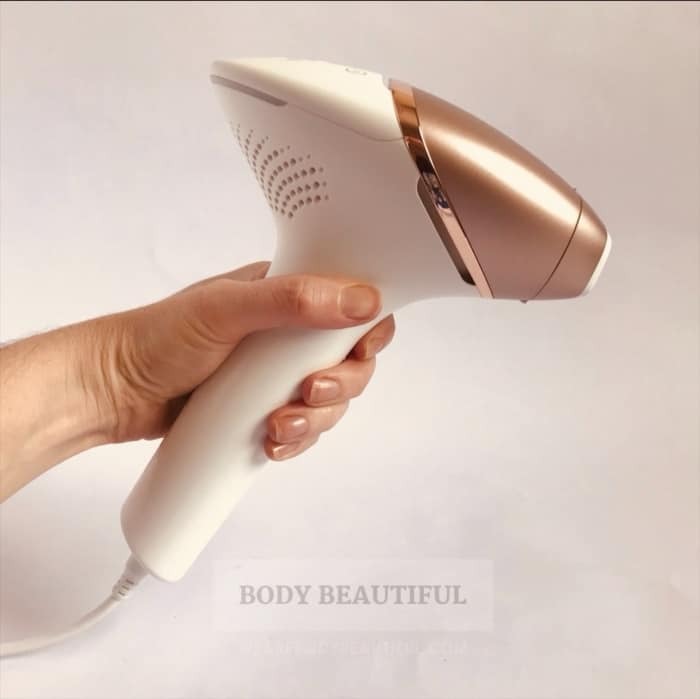 The Lumea Prestige is THE choice for you if you simply demand the best and have the budget to match. It’s a great choice for treating all body areas. But if you want to treat just one or two smaller areas and have a smaller budget, you’ll want something cheaper that’s still a great investment. For this the Advanced is a top choice. 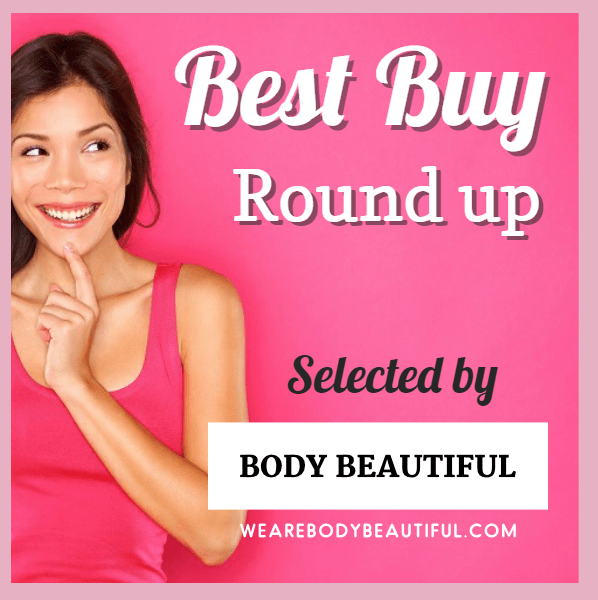 I recommend the Lumea Prestige BRI954/6/3/0 if they’re in your budget range. They’re top spec and the best performing devices I’ve tried. 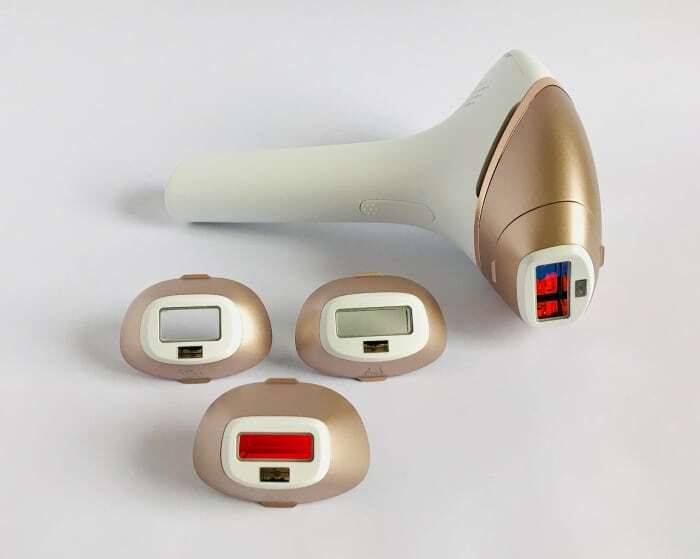 The premium spec of the Lumea Prestige makes it my Overall best buy home IPL device. I recommend it for face and full body treatments on light to dark skin and dark hair. It’s in a different league. If you can afford it, buy it. Read the full review for more information and photos or check prices below. 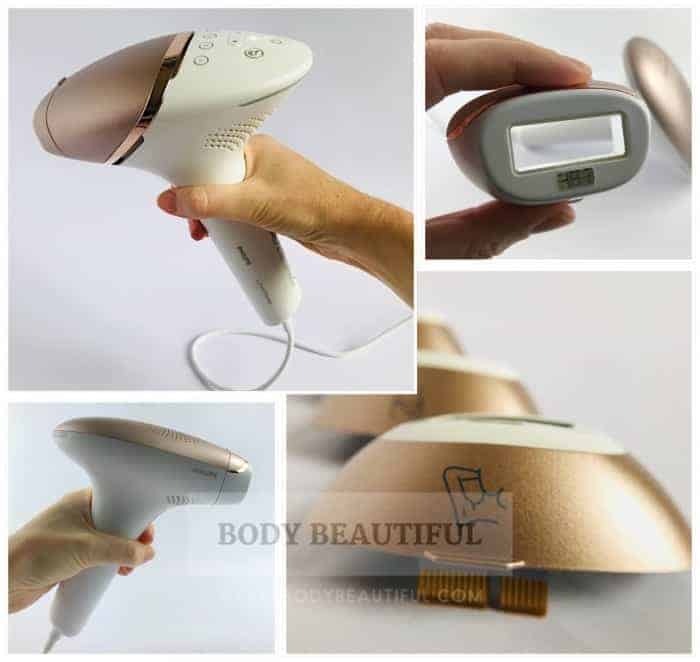 Buy Lumea BRI956 from CurrentBody.com: UK & Global shipping. 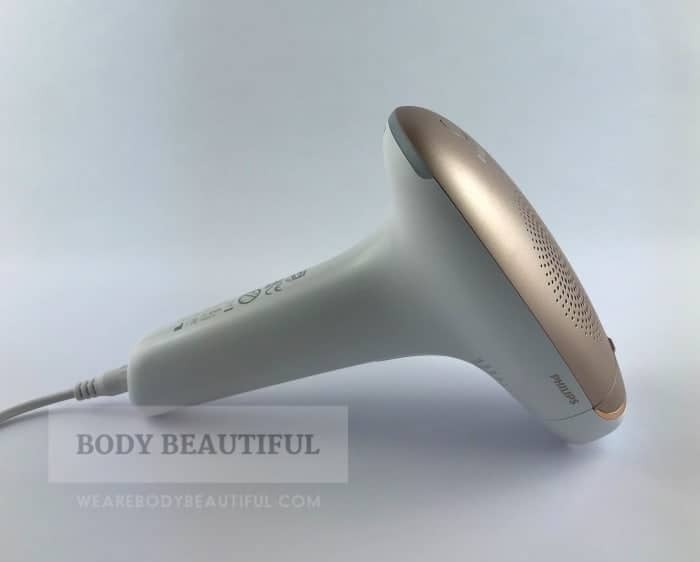 Buy Lumea BRI950 from CurrentBody.com: UK & Global shipping. 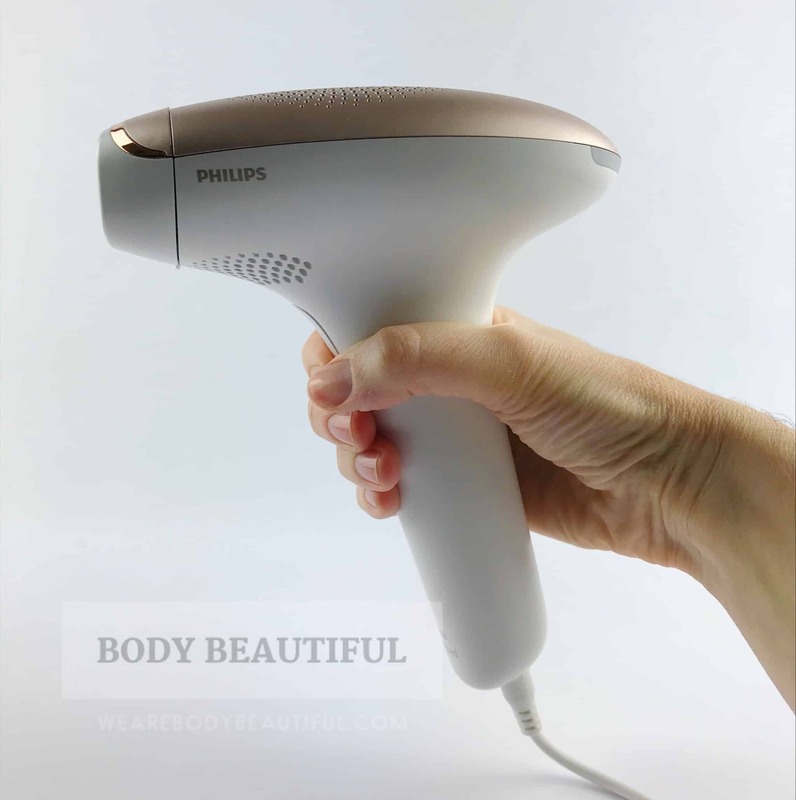 I recommend the Philips Lumea Advanced for a mid-range budget, and especially for treating smaller body areas with lighter skin tones. 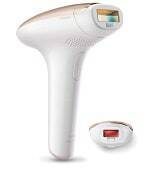 The Lumea Advanced is also a fab choice, it’s my Best at home IPL hair removal for smaller body areas. Plenty of online reviewers choose it specifically because it’s the less expensive cousin of the Lumea Prestige. I recommend it for small areas like underarms, bikini line and forearms on light to medium skin and dark hair. Check out the full Advanced review for more detail and photos or check prices using the links below.